Roger Ribbit is a street thug and leader of a small group of goons. But when he's set up and left for dead, Roger begins to realize that no one in Void City can be trusted. After recovering from his near-death experience, Roger roams the streets searching for any clue that might lead him to his attackers and ultimately the one who masterminded his demise. 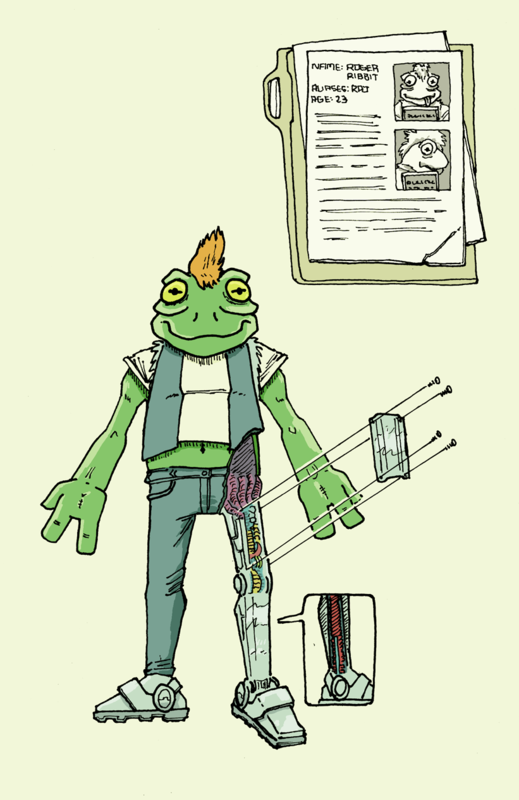 Roger's powers are derived from his robotic legs, which he acquired after losing his original legs to irreparable damage from his attempted assassination. These 'robo-legs' allow him to jump great heights and attack with super-strength using kicks, however malfunctions and general ineptitude can make him vulnerable in battle. Roger (or "Rodge" as he is sometimes called) is a rude dude with a lotta 'tude. He's unapologetic in his opinions of others and often finds himself in some sort of verbal conflict. He's a bit of a dummie, which doesn't help the learning curve in harnessing the full potential of his robotically enhanced legs.